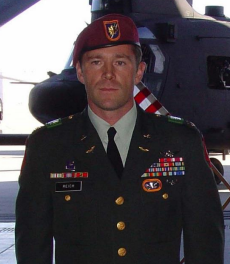 MAJ Stephen C. Reich died June 28, 2005, in eastern Afghanistan when his MH-47D Chinook Helicopter was shot down by enemy fire during combat operations. He was born May 22, 1971 in Ohio, and was raised in Washington, Conn. He graduated from the United States Military Academy with a Bachelor of Science degree in Arabic and Spanish, and received his commission in 1993. In 1994, he attended the Aviation Officer Basic Course and Initial Entry Rotary Wing training. In 1995, he was assigned to the University of Kentucky ROTC program, and played professional baseball in the Baltimore Orioles organization. Returning from Germany in 2000, MAJ Reich attended the Infantry Officer Advance Course at Ft. Benning, Ga. followed by the Combined Arms Services Staff School at Ft. Leavenworth, Kan. Upon arrival to the 160th Special Operations Aviation Regiment (Airborne), he was assigned to 2nd Battalion and later deployed to Operation ENDURING FREEDOM in October 2001 as Battle Captain in support of Task Force Dagger. In December 2001, he served as Operations Officer for 2nd Battalion's detachment of MH-47E aircraft in Afghanistan. He commanded Headquarters and Headquarters Company, 2nd Battalion from February 2002 through May 2003. MAJ Reich then completed a one year assignment to Daegu, Republic of Korea as the Operations Officer for E Company, 160th SOAR(A). He took command of B Company, 3rd Battalion, 160th SOAR(A), Hunter Army Airfield, Ga. on August 5, 2004. MAJ Reich's military schools include the Airborne Basic Course, the Air Assault Course, the UH-60 Aviator Qualification Course, the Infantry Officer Advanced Course, the Combined Arms and Services Staff School, the CH-47D Aircraft Qualification Course, Survival, Evasion, Resistance and Escape Course, and the Special Operations Training Course. His awards and decorations include the Bronze Star Medal, the Meritorious Service Medal (1 OLC), the Army Commendation Medal (1 OLC), the Army Achievement Medal (3 OLC), the National Defense Service Medal w/Bronze Service Star, the Armed Forces Expeditionary medal, the Kosovo Campaign Medal w/Bronze Service Star, the Afghanistan Campaign Medal, the Global War on Terrorism Expeditionary Medal, the Global War on Terrorism Service Medal, the Korean Defense Service Medal, the Armed Forces Service Medal, the Army Service Ribbon, the Overseas Service Ribbon w/numeral 2, the NATO Medal, the Joint Meritorious Unit Award, the Senior Army Aviator Badge, the Airborne Badge, and the Air Assault Badge. He was posthumously awarded the Bronze Star Medal, the Purple Heart, the Meritorious Service Medal, the Air Medal with Valor device and the Combat Action Badge. MAJ Reich is survived by his wife, Jill; his parents, Raymond and Sue, and two sisters, Megan and AnnMarie.